Marvin Paul was born on 5 February 1920 in the rural community of Lone Pine, Pennsylvania. He was a son of Shirley D Paul and Adeline Sowers who owned and operated a dairy farm, back in the days when milking was done by hand. Marvin with his three brothers and two sisters grew up as farm hands. Dairy farming is demanding work as the cows are milked and fed twice a day every day. Even while attending Beallsville High School, located about ten miles away, he delivered milk every morning before school. He graduated in 1937 in a class of twelve students. Marvin continued his eduacation earning a two-year degree from Coyne Electrical School in Chicago, Illinois. Upon completion he returned to Lone Pine and found a good job with a local coal mine as an electrician. Marvin thought he had his future secured... until Pearl Harbor. Two days after Pearl Harbor, Marvin enlisted into the Army and was officially inducted on 15 December 1941. At this time, we do not have his training records but obviously at some point he took the pilot's exam and passed. Upon graduation he was commissioned a 2nd Lt on 28 May 1943. From there, we assume he went to B-24 Training before getting his crew assignment. Our records begin with him and his crew going through Combat Crew Training at Casper, Wyomong. On 26 January 1944, the Paul Crew was assigned to the 492nd BG at Alamogordo, New Mexico. They were assigned to the 859th BS and designated as Crew 917. While training with the new group, Paul was promoted to 1st Lt. It should be noted that promotions for crew pilots were extremely rare while this group was at Alamogordo, therefore reflects something extra special about Marvin Paul. Marvin Paul began his combat tour flying as Element Leader. He flew, without fighter protection, in three of the Group's toughest air battles with the Luftwaffe. The first rough one was to Brunswick on 19 May when the Group lost eight planes. The next one was the 29 May mission to Politz, in which the Luftwaffe took a heavy beating from the unescorted 492nd. The other one was again to Politz on 20 June when the group's entire left squadron was wiped out. The Paul Crew, as well as most of the 492nd crews, also had the distinction of participating twice in the infamous D-Day invasion at Normandy. Paul and his crew had been lucky but were even luckier when given the day off on the 7 July mission to Bernburg because every plane in his squadron was shot down during another deadly battle with the Luftwaffe. The heavy losses suffered by the 859th BS created openings for new Lead Crews, offered to the more experienced crews. Having accepted the responsiblity of Lead Crew, Marvin Paul was promoted to Captain. Lead Crews do not fly combat missions as often as the other crews because their duties include training other crews as well as undergoing additional training themselves. Captains are also part of the command staff and given full-time jobs assisting in daily operations. Perhaps if he had turned down the job, his crew could have finished their tour before the 492nd was disbanded. Or they may have gotten shot down on other hard luck missions flown by the Group. When the 492nd was disbanded in August, the Paul Crew had 25 or 26 missions. At this time their mission count is not clear but they were short on completing their 30 mission combat tour. They were transferred to the 467th BG. Officially, the former 859th BS from the 492nd BG was transferred on 10 August 1944 to the 467th and resedignated as the 788th BS. The Paul Crew was renumbered as Crew 4. After flying one mission, they were reassigned to the 791st BS and redesignated as Crew 87. How many missions they flew with them is still being researched. By August the bombing pace of the 8th Air Force had slowed down compared to the earlier months. Then the Group was stood down between 12 September and 2 October to run emergency gasoline to Patton's Army who had outran their suppy lines. Many of the former 492nd crews were close to finishing their tours when they came to the 467th BG so for them time seemed to drag on during the fall of 1944. However, their frustrations were offset knowing if they went home too early they might get assigned another tour in the Pacific. Including himself, Marvin took up a skeleton crew of five for this non-combat assignment. Things went well until the wings iced up sending the plane into a spiral. Marvin ordered the crew to bail out. After three of the men jumped, Marvin regained control of his ship. He was able to reach land and crashland on a runway. Marvin wounds were serious enough to send him to the States to recover. Details of the crash are provided in the links at right. Marvin spent the rest of the war recovering from his injuries. 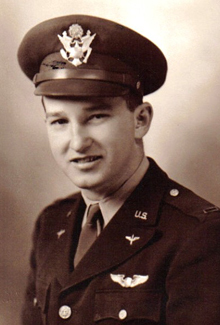 By early 1945 he was back in good shape but the doctors imposed a six month limit to his physical assignments thus sent to the 4th Air Transport Command Group to ferry airplanes. During this time, Marvin met Lois Ann Langenbacher and married her on 2 April 1945 in Winchester, Virginia. Their whirlwind romance lasted a lifetime. On 17 October 1945 after receiving a clean bill of health, he was relieved of active duty and reassigned into the Army Air Force Reserve. He served in the Reserve, later to be under the US Air Force, until 5 February 1980 and retired at the rank of Lt Colonel. Falling back on his former trade, Marvin worked a few years as an electrician at Hazel Atlas Glass Company in Washington, Pennsylvania. While working the night shift, he attended Washington and Jefferson College during the day. Later he left the company to accept a position as an electrical inspector for Middle Department Inspection Agency in Washington, Pennsylvania, where he remained for over thirty years. Marvin's hobbies included gardening, boating, golf, bowling and playing chess and checkers. He had a reputation as being unbeatable in chess and checkers, grew the best tomatoes and his bowling scores earned him membership in the 600 CLUB. He was a strong member of the Faith United Presbyterian Church. Highly respected in his community, he was known as a man of his word. More importantly Marvin was best known as a loving husband, father and grandfather. When he passed away on 2 January 1997, he was survived by his wife, two children, four grandchildren and seven great-grandchildren. Lois still resides in Washington, Pennslyvania. Page last modified Wednesday, June 22, 2011.